"Out of the way. He needs to be put down for good...He killed our brothers. Don't waste your gift on him." 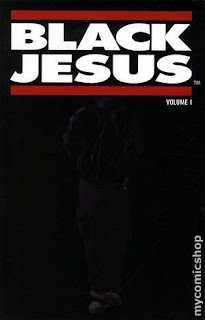 The above dialogue comes from Arcana's Black Jesus, a graphic novel focusing on a young man in New York City who is born "special." The young man, Chris, tends to keep to himself, and has recently been spotted in various parts of town healing people and performing miracles. One of his first "special" acts was him walking on water to save three children. Although walking on water to save three children is a "big deal" in itself, what intrigued me the most about this act was the context in which it took place. While the children's mother is in another man's car "doing the do," her kids stared playing with her car, and accidentally drove the car over a mini cliff, into a frozen lake and cracked as soon as the car hit it. As the car began to sink, Chris walked on the water and pulled out the three kids. As the mother is hysterical and onlookers are amazed, Chris returns the children to her mother and leaves. In case you have not guessed it yet, this is not what you would call a "Christian" graphic novel. In addition to Chris, the other major players in the story are the Black Christian Gangsters (BCG, a Militant Organization dedicated to eradicating criminals and "sinners"), a popular pastor who is as shady as they come, and those who work for/with the pastor to eliminate Chris, as he is seen as a threat to their established status quo. This "threat" that Chris poses to the "powers that be" is illustrated in the dialogue at the beginning of this post. The assassin, working with/for the "shady" pastor, relentlessly hunted down Chris, killing many people along the way, including people close to Chris. After a major shootout, the assassin was wounded and was slowly dying. While the leader of the BCG wanted the assassin to be finished off, Chris chose to heal him. The assassin's first words after being healed suggest that his healing extended beyond his physical wounds. Surely someone who cares about the "inner" as well as the "outer" person is a threat right? "You sure you want to be on your own?" "They'll keep comin' ya know. Hunt you down, like an animal..."
Similar to the scene I just described, most of the story contains elements that are very graphic. While this is definitely not something younger audiences should read, I would recommend it to adults. In fact, I think to some extent the graphic nature of the story is important in that it provides a "reality-based, in-your-face" approach to the question: If Jesus were to return in 2010, (a) Where would he spend His time? (b) How would people react to His return? 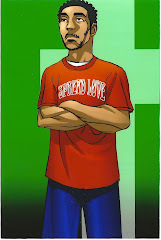 (c) Who would have beef with his life-saving power (physical, psychological, social, and spiritual) and why? Although Chris did not appear to commit any "sins" in the story and the story's seem to be comparing Chris to Jesus, I am not making that comparison, nor am I saying that everything Chris did would be exactly what Jesus would do when He returns. All I am saying is that in general, the story does a good job of encouraging me (and I hope other readers as well) to think about what Jesus' saving power means for our world today.